We always book the largest room at our conference for Karen’s workshops because they’re unfailingly standing room only. Karen is a truly skilled communicator that consistently delivers quality content that hits the mark! I have received incredible feedback from all across the organization how impactful and timely your remarks were. You were amazing! We were told how good you are – and now we know for ourselves. You really run a fabulous program and it fit perfectly with the leadership challenges of personal branding and executive presence. When it comes to connecting with and motivating an audience, Karen Friedman is second to none. Her message to senior executives was compelling, her content was “application-ready” and her delivery was masterful. I was wowed by your talk. I've done speechwriting and coaching for more executives than I care to remember, and I wish I could have given them a tutorial with you as the centerpiece. Your keynote speech was inspiring, motivating, and your passion was really amazing! I’ve heard so many individuals comment on how great you were and how much they learned from you. You are the BEST program we've ever had – you epitomize the message you deliver. You are believable, knowledgeable, warm, animated and effective. I have received endless compliments on your presentation. People appreciated your energy and how "simple" you made it for the audience to incorporate your insights into their everyday routine. You have this unique ability to convert passive listeners into active participants and communicate one-to-one on the level of your audience. I don't know anyone who can be in the same room with you and not be entertained or interested in the subject you are speaking about. The feedback from the audience was incredible. You are truly amazing at your profession and a true inspiration to others! There was an instant chemistry and connection with the audience that lasted throughout the evening. Your talk was one of the most powerful talks for executives and professionals I have ever seen! If you’re looking for a memorable program or dynamic speaker for your next meeting or conference, you have landed on the right page. Organizations across the country continually rank Karen Friedman as the top rated speaker at their event. She has earned the highest speaker ranking at numerous leadership conferences including: the Healthcare Businesswomen’s Association, Public Relations Society of America, International Association of Business Communicators, the American Society of Training and Development and dozens of internal client meetings – making her a perfect choice for any situation that requires a master communicator. 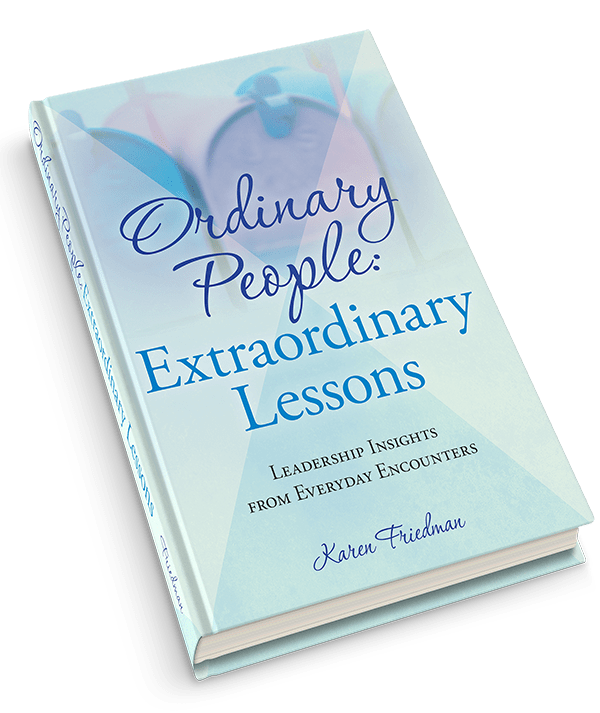 A dynamic favorite at company meetings, association and corporate events, Karen Friedman is an engaging inspiring speaker who repeatedly earns top-notch ratings and rave reviews at companies across the globe. Audiences say she has the unique ability to connect with one or one thousand regardless of industry; empowering them with tools and techniques to create a more powerful presence, executive image and teaching them how to effectively communicate in today’s demanding business environment. Her energy, passion and contagious enthusiasm to make a difference for others has generated standing room only programs that she will tailor to address the specific needs of your audience. Whether running a business unit, developing life-saving therapies or articulating our vision, how can we apply our unique perspective to contribute more effectively and communicate our message with maximum impact across diverse audiences? This workshop – featuring on-the-spot coaching and interactive exercises – will provide practical strategies and easy to-use techniques that you can apply as soon as you leave the room. Be better positioned to express ideas, command attention and project greater presence, whether you are talking to management, co-workers or customers. By leveraging the three P’s ― purpose, power and presence ― you’ll learn how to empower listeners, influence key audiences, and come across as the leader you want others to see. Do you want to increase sales? Motivate employees? Influence important stakeholders? Learn how to share business success stories to engage attention and drive results. This sought-after program teaches you how to tweak your storytelling skills to make messages meaningful and relevant in todays’ challenging environment of short attention spans. Learn how to inspire others when you talk to help you earn an influential seat at the table. You’re climbing the career ladder and have worked tirelessly to create a good reputation. But how do you communicate your brand so you truly are the person you want others to see? Packed with practical relevant strategies and techniques to help you sell ideas, articulate your vision and communicate clear crisp messages with maximum impact, this lively interactive session will transform the way you connect, motivate and inspire important listeners. Discover how to improve your performance and step out of your comfort zone so others see you as a more commanding and connective leader. You’re at the top of your game — experienced, respected and influential among your peers. But can you clearly and concisely articulate important ideas in a way that captures attention and inspires others to action? Learn how to craft a personal persuasive vision statement that tells people who you are, what you stand for and why they should follow your lead. Discover how to turn your everyday experiences into memorable stories that send powerful messages and build rapport with listeners. In today’s high-tech world, there are more ways than ever before to communicate: email, text messaging, voicemail, blogs, tweets, video calls and remote meetings. But one thing remains the same: engaging listeners so what you say is what they hear can drive results and change outcomes. Whether talking to colleagues, customers, prospects or at an industry conference, strategies to communicate your message for maximum impact will help you captivate and empower listeners to help you make a great impression every time you speak. 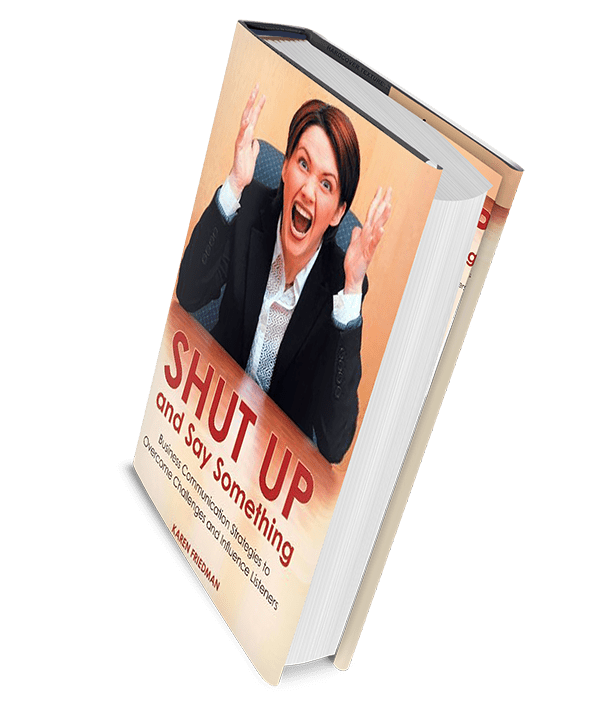 With heart warming examples from Karen's best-selling book Shut Up and Say Something, walk away with business communication strategies to overcome challenges and influence listeners. Tired of being told you need to act more like a man to advance your career? This intriguing program gives you permission to throw out conventional wisdom and use your natural born skills as a woman to showcase your own personal brand. Packed with techniques to confidently communicate the person you want others to see without compromising credibility, you will learn how to handle interruptions, take ownership of your ideas, avoid apologetic language and use conversation to connect and collaborate in the workplace. Discover how to identify your strengths by seeing yourself through the eyes of others to become the person you want people to see. You’ve just been promoted to a new leadership position. You don’t know what will come up or what new challenges will keep you up at night. But you do know you need to quickly create momentum and put your best foot forward. Taking on a new leadership position is one of the most challenging events in a persons career. This powerful program unveils best communication practices to help participants maximize their effectiveness during the first 100 days in a new leadership role. Learn to improve relationships, overcome communication obstacles and foster an atmosphere of trust and respect to ensure a successful leadership transition. Are your presentations exciting or exhausting? Are you constantly staring into blank faces or worse yet, sleeping ones? Have you ever stopped to ask yourself is my product the problem or am I a product of the problem? A survey of top paid executives found that these executives believed their communication skills were the number one reason they made it to the top. Presenting to colleagues, senior management or other critical audiences demands far more than knowing your material and developing slide presentations. This program will show you how to turn communication into capital by teaching you how to polish your podium skills and connect with an audience of one or one thousand. Finding a new job, changing positions or reinventing yourself in today’s uncertain marketplace is daunting for anyone but it’s especially scary in today's challenging environment. Perhaps you have more options than you’ve ever considered. In this popular session, learn how to leverage your natural born strengths, create more meaningful dialogue and re-balance the discussion to tip the scale in your favor. Learn to showcase talents others might not even know you possess so you come across as a confident commanding communicator who can lead and adapt during changing times. Delivering negative news can be difficult, challenging and stressful to even the most seasoned communicator. Learn inside secrets Karen has shared with hundreds of executives to help them develop and deliver difficult messages to build goodwill and protect their hard earned reputations. In this hands on session, you'll learn how to confidently turn negatives into positives and maximize results during the toughest of times. An advisor to newsmakers and dozens of Fortune 100 companies across the globe, Friedman’s no-nonsense tips and techniques will give you the skills and confidence and to say and do the right thing to shine in the spotlight. Imagine a TV camera, microphone, blogger or print reporter recording your every word. You forget what you wanted to say or say the wrong thing because you're nervous or perhaps you don’t understand what the reporter really wants. Find out how you and your company can make the most out of every media encounter or public appearance during this one of a kind session with live role-playing that will teach you how to ace every interview and become a valued media resource. Have you ever been so riveted to a television broadcast that you could not take your eyes off the screen? Learn how to use story telling and other coveted broadcast techniques to create fast-paced memorable content that can turn ordinary employees into extraordinary business communicators. In this session, former award winning television reporter Karen Friedman who has counseled executives on four continents teaches you how to create engaging, visual and impactful communications in today’s fast-paced 21st century workplace. Learning to deliver information with style and impact is critical to leadership success. Some characterize these personalities as people who have 'it'. But what is 'it' and how do you get 'it'? Are you born with 'it' or can you learn to develop 'it'? This program will teach you how to create and sustain a more powerful presence so others see you as a strong confident and commanding communicator who can engage listeners and command any audience. We’ve all met people who seem to have a wow factor. They appear strong, confident and charismatic from the way they speak to how they carry themselves. Like our favorite contestants, we follow their lead and cheer them on to victory. How can the same characteristics be used to propel others to greatness in the workplace? Are you born with star power or can you learn to develop it? Through interviews and contestant examples, discover how to harness your own personal style to become a leadership idol. Whether delivering a keynote presentation, breakout session or moderating panel discussions, Karen will inspire, motivate, educate, make you laugh and leave you wanting more. If you want to keep your event lively and interactive, Karen Friedman is the perfect facilitator, moderator or event host to lead discussions, panels, brainstorm ideas and keep your meeting moving. As a professional coach, speaker and veteran newscaster, companies and associations continually rely on her to help groups generate ideas, stimulate thinking and break through barriers to reach consensus. As an experienced facilitator, Friedman is continually applauded for creating safe meeting environments that allow passive listeners to become active participants. To book Karen, please call 610.292.9780. For a look at more samples of Karen speaking, click here.